Since its release in 1998, this classic saga of mystery, intrigue, and adventure has set the standard for Dungeons & Dragons computer roleplaying games. Customize your hero's traits and abilities, recruit a party of brave allies, and explore the far corners of the Sword Coast in your search for adventure, profit... and the truth. All of that is about to change. Forced to leave your home under mysterious circumstances, you find yourself drawn into a conflict that has the Sword Coast on the brink of war. An iron shortage of unknown origin threatens to plunge the city of Baldur’s Gate into conflict with Amn. Meanwhile, there is something else at work, far more sinister than you can even begin to fathom...For as long as you can remember your view of the world has been limited to the heavily fortified walls of Candlekeep. Your foster father, Gorion, has done everything in his power to protect you, and keep you out of harm’s way. 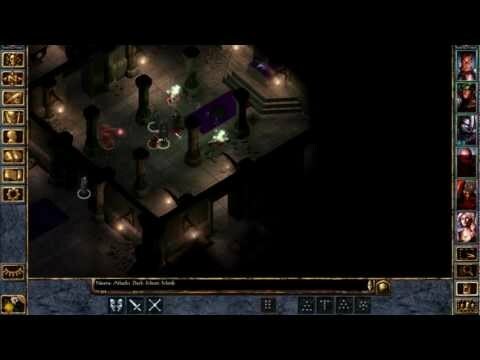 Tales of the Sword Coast: Explore the fabled Durlag’s Tower and more locations from the original Baldur’s Gate expansion. The Black Pits: You have been captured and forced to fight in Baeloth’s marvelous arena. A myriad of monsters await, as well as countless other adventurers who face the same fate. Maim, murder, and maul your way to freedom…if you can! Gallery of Heroes: Reimagine your character with eleven never-before-seen character portraits from acclaimed Icewind Dale artist Jason Manley! Discover countless improvements we’ve made to the original game, including high-resolution fonts, an improved interface, dynamic zooming, and more! We’re making improvements all the time; join the discussion on our official forums, or visit the Baldur's Gate: Enhanced Edition website to learn more!